For my design analysis I chose AmazonSupply, an industrial supplier operated by Amazon.com. My current work outside of ITP is in a similar industry, and the design practices associated with this kind of industry are usually very bad. 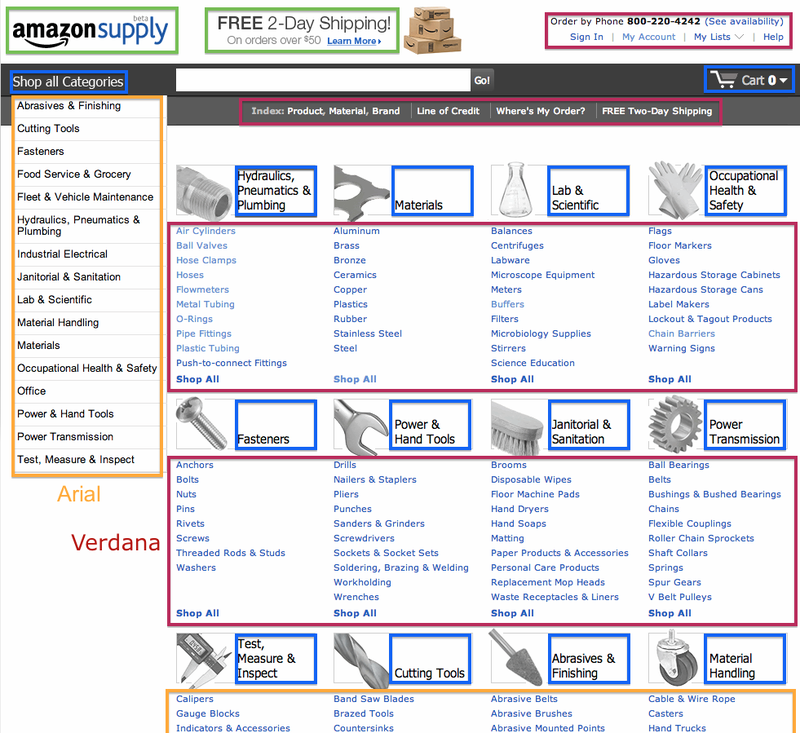 However, AmazonSupply sets the standard for such a website. 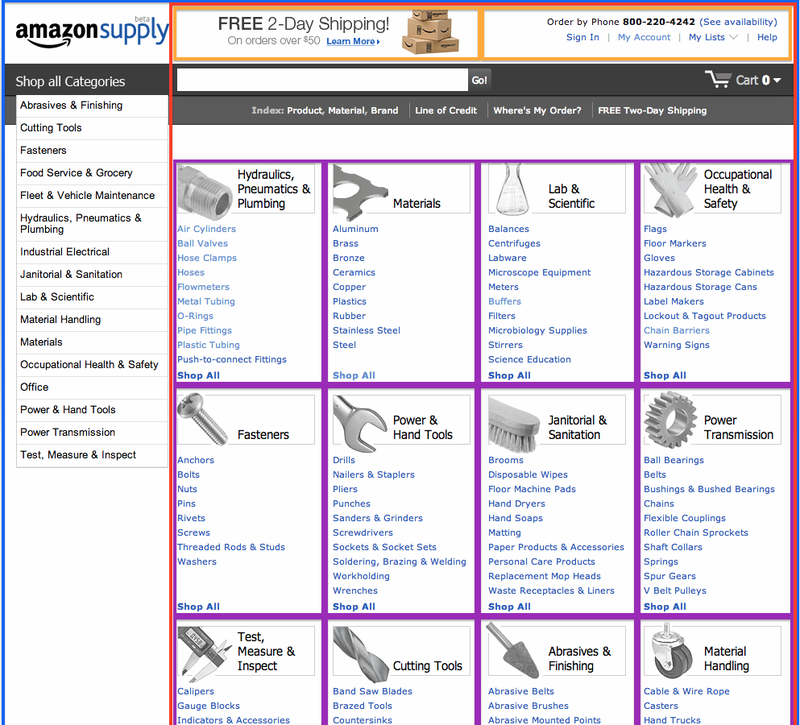 The home page has five columns - one for navigation and four for product grouping - that keep the information organized. The header content is split over the first column and then centered over the remaining four columns. As far as negative space is concerned, there is not that much room to breathe. One of the hallmarks of this industry is to pack in as much information as possible. 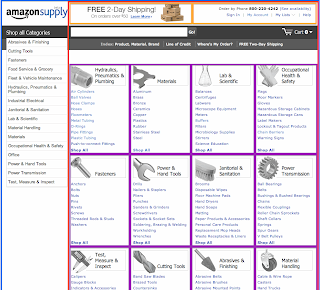 AmazonSupply uses the grid system combined with a white background to make the content stand out through contrast. 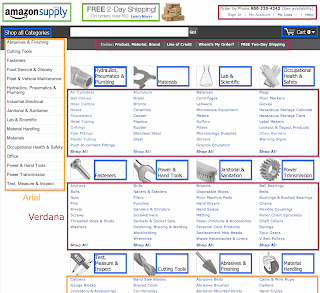 The two primary fonts are Verdana and Arial, used for the product category links and the vertical navigation menu, respectively. I could not identify the other fonts in use (in blue and green boxes) although part of this is the AmazonSupply logo. Regardless, all fonts are sans serif which gives the page a clean feel. Finally, the color system is very simple which adds to the clean feeling. Besides black and white. there are only six colors used: two blues (#2161BD, #6391D4), three shades of gray (#2E2E2E, #484848, #BFBEBE), and a gold for link hover (#CC7A00). To summarize, adherence to a strict grid, use of similar typefaces, and a basic color scheme make AmazonSupply easy on the eyes and easy to use.